The future looks bright for the Ayrshire breed—at least if these three young women have any say in it! 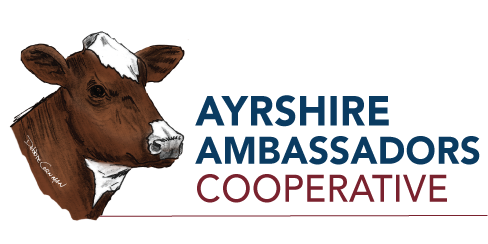 Their passion is exactly what the Ayrshire community needs these days, and it started at Hameau Farm in beautiful Belleville, PA. Here’s a look at a few faces of the future and how they plan to help build a better legacy for the breed! Todays’ dairy farmers are subject to ebbs and flows of the market, and it’s no secret that the profit margin is continually shrinking, to the point where farmers may not break even. Terri Lawton of Foxboro, MA grew up watching her dad struggle to make ends meet, but she had bigger ambitions for herself. She knew from the start she didn’t want to take the shamefully low milk price. Today, thanks to her determination, she runs her own raw milk dairy (Oake Knoll Ayrshires) and the Foxboro Cheese company, making a profit margin that can support a family and employees. And at the core of her success is her even-tempered, efficient Ayrshire herd.